2009 Bordeaux Wine buying guide for the best 200 wines of the vintage with Tasting Notes, Ratings, Reviews and special buying tips from this sublime and uniquely styled Bordeaux wine vintage. This vintage report from 2009 Bordeaux covers the top 200 2009 Bordeaux wines from all the top Bordeaux wine appellations ranging from St. Estephe, Pauillac, St. Julien, Margaux, Pessac Leognan, Pomerol, St Emilion and more. 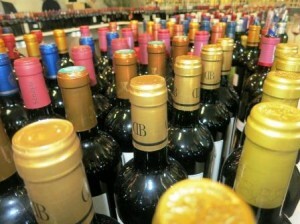 These 2009 Bordeaux tasting notes and comments were recorded from June 23 to July 11, 2010 in Bordeaux. The 2009 Bordeaux tasting notes are arranged by appellation from north to south, from St. Estephe to Pauillac, St. Julien, and Margaux through Graves and over to Pomerol, ending in St. Emilion. That is the order in which the 2009 Bordeaux wines were tasted as well. 2009 Bordeaux is an important vintage for consumers to take note of. Many of the best 2009 Bordeaux wines are stunning in quality and offer a unique, ripe, opulent, sensuous style. The wines are deep, round, rich, ripe and filled with glycerin. The fruit, skins, seeds and stems achieved phenolic ripeness, but 2009 Bordeaux is not a consistent vintage. The northern Medoc, Pauillac and St. Estephe produced stunning 2009 Bordeaux wines. On the Right Bank, Pomerol was much more successful than St. Emilion where many 2009 Bordeaux wines seem to lack freshness from a lack of acidity that allowed some wines to feel flabby. While considered expensive when the 2009 Bordeaux wines were first offered, the subsequent vintage, 2010 Bordeaux was much more money. The very high prices being asked for 2010 Bordeaux forced prices for numerous 2009 Bordeaux wines to rise to meet the current level of demand.